What happened to our rights to peacably assemble and petition for redress of grievances? They're still in force as long as you're in a back room with a closed door. 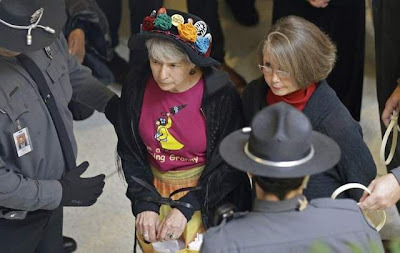 But older women wearing flowered hats are a HUGE menace to the Way of Life the Clown College is trying to impose. I love it when lefties talk about sanctity of life and advocate for killing unborn children in the same sentence of pointing out Republican hypocrisy.